Next up in the Larry Cohen Collection is the cult classic “Maniac Cop,” a battle of the chins between Bruce Campbell and Robert Z’Dar. 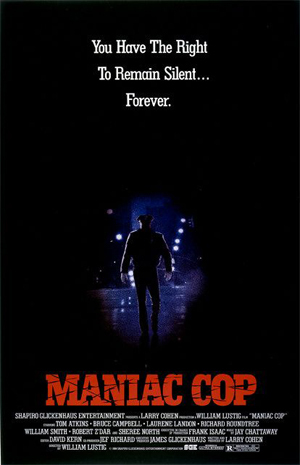 The cinematography on “Maniac Cop” was provided by two people: James Lemmo (“Maniac Cop 2”) and Vincent J. Rabe (“Hit List”), neither of whom have had much in the way of significant film credits. 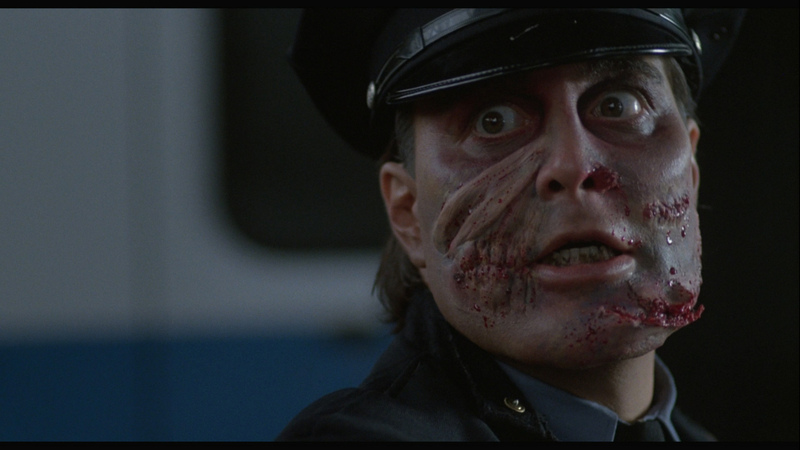 The effects team for “Maniac Cop” included makeup work by Brad Look (“Thor,” “Star Trek: First Contact,” “The Hunger Games”) and Bill Miller-Jones (“Hell Comes To Frogtown,” “Maniac Cop 2,” “Maniac Cop 3”), visual effects by Larry Arpin (“The Dentist,” “The Expendables,” “Leprechaun,” “The Ambulance”), and special effects work by David Atherton (“Face/Off,” “Shocker”), John Naulin (“From Beyond,” “Re-Animator,” “Highlander II,” “The Omega Code”), Paul Staples (“Fatal Games”), and Laszlo Stumpf (“Cyborg,” “American Ninja 2”). The cast of “Maniac Cop” reads like a b-movie all-star team: Bruce Campbell (“The Evil Dead,” “Army of Darkness”), Tom Atkins (“Halloween III,” “The Fog”), Robert Z’Dar (“Soultaker,” “Samurai Cop,” “Tango & Cash”), Richard Roundtree (“Shaft,” “Q: The Winged Serpent”), Jill Gatsby (“Vampire’s Kiss,” “Class of 1999,” “The Ambulance”), James Dixon (“It’s Alive”), and beloved director Sam Raimi (“The Evil Dead,” “Drag Me To Hell”). The story of “Maniac Cop” follows an investigation into a series of murders committed by a man dressed as a police officer in the streets of New York City. The NYPD is desperate to find the culprit as the public is whipped into a frenzy of suspicion and distrust of the department. Meanwhile, the investigation begins to uncover a possible suspect with a motive for revenge against the NYPD brass. Two of the stars of “Maniac Cop,” Bruce Campbell and Robert Z’Dar, have both gone by the nickname of “The Chin” due to their distinctive facial structures. 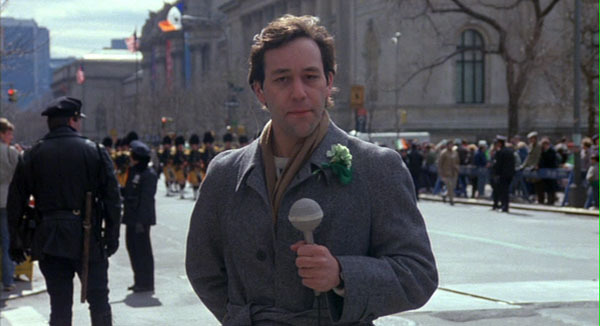 Sam Raimi, the acclaimed director of films like “The Evil Dead” and “The Evil Dead II,” appears not only as an actor in “Maniac Cop,” but also worked behind the camera for the St. Patrick’s Day parade sequence in the movie. Famed boxerJake LaMotta, whose biography provided the source material for Martin Scorcese’s “Raging Bull,” acts in a brief cameo in “Maniac Cop” as one of the unnamed police officers. “Maniac Cop” was filmed back to back with another William Lustig film, “Hit List,” which starred Leo Rossi (“Leonard Part 6,” “Maniac Cop 2”) and Lance Henriksen (“Aliens,” “The Last Samurai”). Over the past couple of years, rumors have surfaced about a potential “Maniac Cop” remake or prequel involving director Nicolas Winding Refn (“Drive,” “Only God Forgives”) and writer Ed Brubaker (“Captain America: The Winter Soldier”), though I haven’t been able to dig up anything since May 2014. “Maniac Cop” was not particularly well-received, and currently has Rotten Tomatoes scores of 50% (critics) and 39% (audience), along with an IMDb rating of 6.0. That said, it certainly has a dedicated cult following. 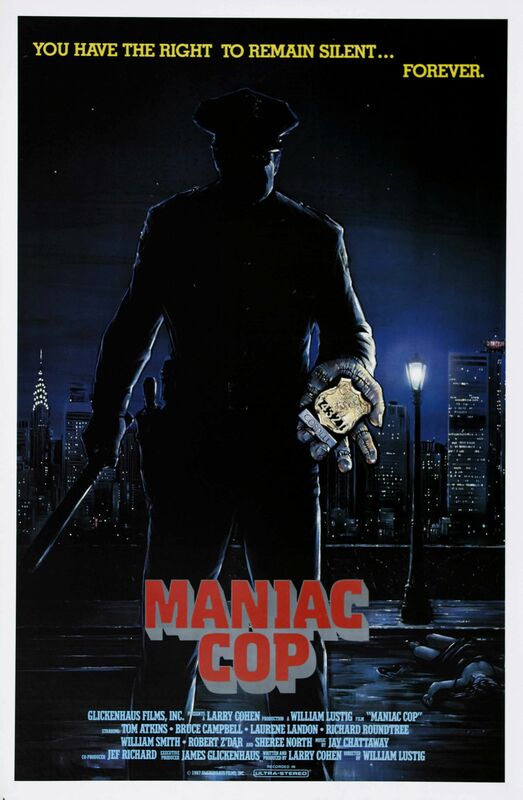 “Maniac Cop” didn’t make money on it’s limited theatrical release, grossing under 700,000 on a 1.1 million budget, but still turned into a horror franchise of some note with a series of three films. Just as any good horror movie should do, “Maniac Cop” latches onto a public anxiety. In this case, this fear is of the police abusing their position of power, which puts people in a position of helplessness due to the corruption in the institution. “Maniac Cop” doesn’t exactly take a stance on the police in general, and presents both pro- and anti-cop sentiments. The corruption of the institution is emphasized, as well as the (justified) lack of public trust in it. At the same time, a few of the police officers are portrayed as “good” cops: honest, principled, and willing to stand up to the institution at its worst. 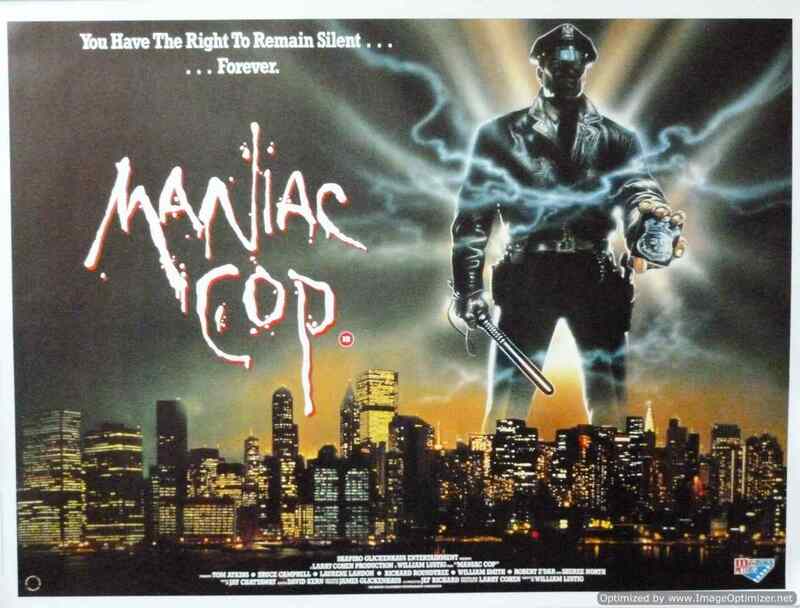 “Maniac Cop” received a harsh reception at the time, in the sense that people seemed to either love it or hate it. It is undoubtedly a b-movie made with generally low quality, which turns off a certain amount of viewers to start with. It also takes elements from a number of genres, such as mystery, slasher, and your typical cop flick, which is a mixture that didn’t necessarily work for everyone. Further, it isn’t as campy or hammy as you might expect for a film with Bruce Campbell in the lead: he actually plays his role pretty straight, which is unusual. It doesn’t help that the movie is also a pretty slow burn, something that most slasher fans don’t have much patience for. Personally, I like “Maniac Cop.” It is a bit slow, but the intrigue and performances kept me from ever getting bored with it. Likewise, the mixture of the genre elements made it a little more interesting to me than just your typical slasher flick, and the elements of social commentary on the police were more than welcome. I also appreciate that it maintains some of the gritty ambiance of William Lustig’s earlier film “Maniac,” which is one of the stronger elements of that flick. 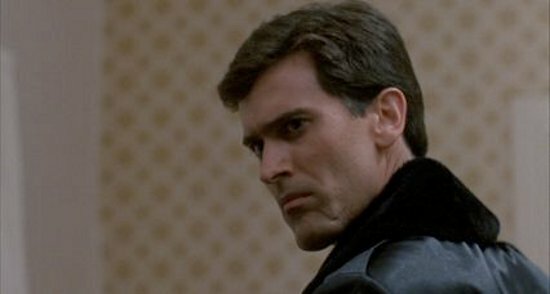 Something that I will agree with the detractors of “Maniac Cop” is that Campbell isn’t quite campy enough for what audiences expect from him, which may have been intentional on either his or Lustig’s part. I also would have loved more of Richard Roundtree in the film, to help illustration more of the corruption in the department (also because he’s just great). Overall, I think b-movie fans will generally find things to enjoy about “Maniac Cop,” though I think specially Cohen and Lustig fans will like it the best of anyone. 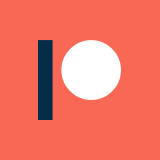 General audiences are a bit of a toss-up: I’m sure there are many who would find it too dull, but I don’t think that is necessarily true across the board. I’m interested to see if the remake actually happens, because I feel like Refn’s style could fit the film quite well, and adapt the story effectively to current audiences. I also think that now may be the perfect time to bring back Cordell, as public anxieties about police run amok seem to be at an all-time high.